Do you pray? How? When? Why? When I was at my lowest,before my liver transplant, my prayers seemed intimate and somehow powerful. They seemed like a two-way interaction, I often sensed God’s presence and comfort like a sudden, warm, summer downpour – the type that makes you throw out your arms and spin in circles. Things are back to “normal” now. That makes me sad. This little church that I strangely find myself leading now days is a great group of people. We’re trying hard to be transparent with each other and figure things out. We’ve worked on stripping away layers of religion to get to Jesus with a desire to follow Him close, in relationship and become like Him. Most of us are not satisfied with the social club approach to church as just something good to do. We want more. I certainly want more. In prayer, I’ve had more but it that was during the darkest season of my life. My days, except for medical appointments, were empty. Though I felt closer to my God than ever before, I simultaneously felt useless to Him. Typing that just now just triggered a flood of questions. Am I ever truly useful to God? Is that what this is about? Is that what I am trying to be? Does God need me to be useful? Is that His goal? God does not need. God is God. I’m the one who needs. God has not changed. I’m the one who has changed. Now my days are usually packed full. I often run from one appointment to the next and hand out apologies for running “a little late.” My list is full of people I want to connect with, have over and get to know. My goal list is long and my dreams are big. My task list is divided into structured priorities of A, B and C with target completion dates beside each task. My … my … my. I sure do say “my” a lot. When I experienced those times of deep, intimate connection with my God through prayer I had no lists, no new friendships and no tasks. My biggest goals, other than surviving to transplant, were to solve Portal 2 on my son’s XBOX video game system. My relationships were few because even some of my friends didn’t want to tire me with a visit or could not handle seeing me in such weakness. My time with God was my top priority because it was all I had. It was a highlight, not a discipline or task to check off. God healed me. He gave me life. He restructured my heart and gave me eyes that see things differently now. I’m thankful for that. Really, I am. I prefer the new me over the old me … I just want more in my prayer life again. I think that’s okay. Yesterday somewhere near 100 of us gathered for worship and I did what I find myself doing every week here in my new life. My responsibility is to stand at the front of the room and talk. I tell you where I feel God stretching me and challenging me and I wonder if He’s challenging you in similar ways. We turn the pages of Scripture and look to find answers in the life and words of Jesus. I feel uncomfortable being the one to talk. I often feel like there has to be someone who is doing life better than me who should fill this role. But, for this season of life, God has me here. Yesterday, I told you I feel like I stink at prayer. Stink at prayer? Yeah. In common core terminology, I don’t feel like I am “meeting the standard” right now. But what is the standard? Who sets it? Is it based on a certain amount of minutes in prayer every day? Is someone checking of my vocabulary words or timing my prayer words per minute? Of course not. I know that’s ridiculous. I think it’s more like every other relationship. When my wife and I start feeling distance between us we’ve learned that we just need to make time together our top priority again in order to remember how much we love each other. It works every time. 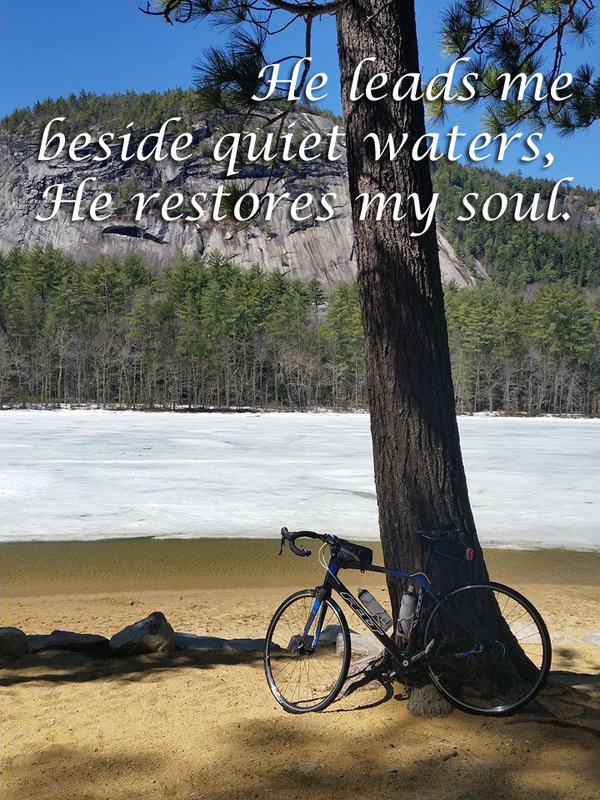 “While it was still night, way before dawn, he got up and went out to a secluded spot and prayed.” I came across those words last week when I spent a couple days cycling in the mountains. It was Mark 1:35 in the ancient book that has shaped my life. I stuck on them and replayed them over and over. The passage is talking about Jesus and a time He prayed. It doesn’t say He did it every day and it doesn’t present it as a formula. It just says Jesus got up early, got away from the distractions and prayed. He did it on His own because He wanted to. It made such an impression that Matthew, John and Luke wrote about it too. Clearly, He also prayed other times and in other ways just like I do. He offered running, through-the-day prayers, prayers for immediate needs and prayers for people. I do that too. You? They are not as deep or intimate but, nonetheless, they are real and important. The passage pulled me to other passages where Jesus withdrew, left His iPhone behind, to head for solitude and stillness to connect with God. When I was so very sick, solitude was not a choice. I was forced into it for hours every day. Now, thankfully, I have a choice. When I don’t choose it, when I live in the quick and busy world of prayer through the day, I’m missing out on a vital part of prayer. Solitude. Yesterday, I challenged our church family to seven days of doing what Jesus did on that day. I challenged us to get up early, even 5-10 minutes early, find a place with no distractions to pray for God’s presence and direction in the day ahead. This morning, on the first day of my vacation, my daughter’s golden retriever started whining at 4:23. (We are dog sitting.) No, I was not happy. But then those words came to mind that while it was still dark, Jesus got up, found a quiet place to pray and spent time alone. It’s 6 am. I’ve fed two dogs, prayed, sipped coffee and connected with God. It feels good. This is what I need to do to live like Jesus. I need to make time not because I have to in order to gain points with God or feel like I am “meeting the standard” but because I am hungry for that closeness, that intimacy, that two-way street. Early morning, mid-afternoon, moonlight … Jesus made time to hang out with the Father despite all the demands and pressures of life. I need to do that too, even after my needy granddog goes back home.